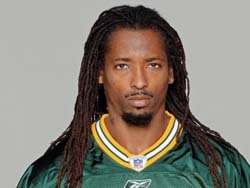 Green Bay Packers defensive back Al Harris is expected to play on Sunday when the Packers face the Giants in New York. But Harris will likely have to play with a heavy wrap around his arm. Harris suffered an elbow sprain serving as one of the jammers on the punt return unit and missed about a quarter of action in the 16-13 win over the Eagles on Sunday. Coach Mike McCarthy said in his press conference on Monday that he&apos;s fairly confident Harris will be able to play against the Giants.